Marco Polo Airport is the main airport in Venice and 8km from the city centre. It has intercontinental flights. An easy and cheap way to travel is with the bus shuttle from Marco Polo airport to Mestre district and Piazzale Roma. This trip takes 20-30 minutes. From Piazzale Roma to St. Mark’s Square is a 2-km walk. If the temperature is hot and if you don’t know the way through the alleys it can take some time to get there. The water bus can be a good choice. A land taxi from the airport to Mestre is €40 and to Piazzale Roma is €45. A public water taxi from the airport to the city centre cost €15 p.p. A private water taxi to Venice centre or the cruise port is €100-€125 (up to 5 people). If your group has more people there will be a surcharge. Budget airlines like Ryanair have departures from Trevisio Airport. Distance to Venice is 25km. The ATVO shuttle bus (€12) has a regular connection with Treviso Airport, the Mestre district and Piazzale Roma. A land taxi to the city centre is about €75. Santa Lucia is the main railway station in Venice. The station is located on the bank of the Grand Canal at the border of historic Venice. To Piazzale Roma is 500m. Passengers can take the water bus to St. Mark’s Square/Lido or walk into the historic centre. Santa Lucia has train connections with Milan, Florence, Rome and abroad (such as Vienna, Prague & Budapest). Mestre is a large district of Venice commune on the mainland where most citizens of Venice live. Mestre station is about 8km from Santa Lucia station. Between both stations operate several trains every hour. Bus line number 2 stops next the station and it takes 12 minutes to Pizzale Roma. The public water bus is the main public transportation service in Venice. Venice’s historic centre (5km2) is built on 115 inlets and counts more than 400 bridges. There are 28 public water bus lines. The most popular one is Line 1 from Piazzale Roma – Santa Lucia – Rialto Bridge – St. Mark’s Square. With the usefull ACTV Tourist Travel Card, tourists have unlimited travel on the water bus for a period of 12 hours – 7 days. The most convenient way of traveling from Marco Polo Airport is with the private water taxi. The fare to Venice centre or the cruise port is €100-€125. 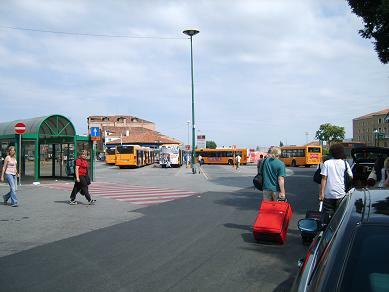 Walking from Piazzale Roma to the cruise port Marittima takes 15-20 minutes. The Alilaguna public water taxi sails in 80 minutes from the airport to the terminals in the Marittima & San Basilio cruise ports. 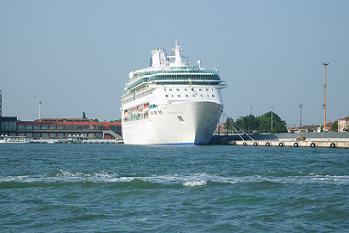 The Venice cruise port has several cruise and ferry terminals. The main facility is the Marittima harbor nearby Piazzale Roma. The terminals of San Basilio and Santa Marta are located at the waterfront of the Giudecca Canal nearby the Marittima. When a cruise boat embarks, free shuttle buses ride to Piazzale Roma. Passengers can also take a land taxi. In front of terminal 103 is a shuttle boat to St. Mark’s Square.